There's something inexplicably thrilling about getting a new game, but how about getting two new games in one? We bet you're giddy already. The next announcement might just tip you over the edge: Professor Layton and the Last Specter is coming to North America on 17th October and contains a bonus game. Layton's had bonus games before of course, but nothing on this scale. Unlocked from the start of the top hat professor's latest adventure is Professor Layton's London Life, a 100-hour long RPG that started life as a mobile game in Japan before being integrated into this fourth outing. In Japan you have to unlock it by completing the game: in North America, it's available from the very start. We told you it was exciting. 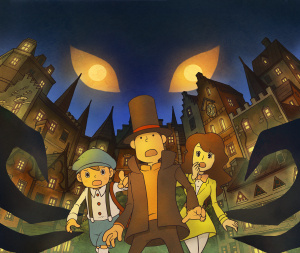 Professor Layton and the Last Specter for the Nintendo DS family of systems is the fourth installment in the Professor Layton puzzle adventure series. It begins a new trilogy that is a prequel to the original games, set three years before the events in Professor Layton and the Curious Village™. The game contains more puzzles than any in the series to date. As a North American exclusive to the overall Professor Layton and the Last Specter package, a bonus role-playing game called Professor Layton’s London Life™ containing more than 100 hours of additional content will be available to players from the start of the game. Already have my copy Pre-ordered. October can't come soon enough! They're keeping in London Life? Double bargain! Sweet potatoes! I am so there! Am I misreading this...or does it say that London Life is an exclusive to North America? Or is it just the ability to play it from the start that's the exclusive? @Jango-Forest Not sure yet, it's certainly ambiguous. It's a lot of text but I'd be gutted if it didn't make it to the European version too. We'll see later this week hopefully. I thought I wouldn't have to pick up another DS game after I bought the 3DS. Obviously I was wrong. London Life is exclusive to North America, but don't worry Europeans remember DS Games aren't region locked! sounds good, I will be getting this. @Buster13 felt the same way! @NintendoMaster That's still the same ambiguous press statement found in this article though, just interpreted by gonintendo instead. I'd rather not have to import (but I will if necessary) so I'm still going to wait for some confirmation with more clarity. This saga is marvelous, I will pick it up of course. London Life is bound to be in all versions of the game. I expect the only difference in the North American version is that it's available from the start, whereas in the Japanese and European versions of the game you have to beat the main game before being able to access it. There's no way LEVEL-5 would remove such a popular - and huge - feature from one of their games for one region. No way. London Life is probably exclusively from the start of the game for North America. It can't technically be exclusive only to North America because the Japanese version also has it. Not a fan of RPG's really. Unless they have the good professor. London Life is the worth the price of admission alone. F*** yeah I'm getting it. Day one is a definite possibilty. Yessss I love Professor Layton! Alright! A 100-hour RPG AND the game! I already had this preordered and now I am super excited that it is street dated AND it has the bonus! Wait a minute...we have been waiting 2 WHOLE YEARS after Japan to get the game and one month after Americans and we won't get the extra bonus game despite the fact that it's already in english and still we will pay the same price for 100 hours less content? And you all europeans gamers are ok with it? What they think are we?Stupid and sheeps? Yeah, the only thing "exclusive" about London Life for North America is that it's unlocked right away, in the Japanese version you had to beat the main game to get it. So don't worry, Europe will get it too. Sweet! If the release dates inbetween the US & Europe are big I'll be importing this. Can't believe London Life is unlocked from the start! Very excited about this, though I have yet to beat any other Layton game which I'll have to do before I can start this one & I'll probably start London Life after I beat the main game, just because that's how it was meant to be played. I'll have to wait and see what the PAL cover is like for this before I grab the USA one - I don't normally put much stock in cover art, but the previous three PAL Layton ones have been gorgeous! Still need get Unwound Future. Maybe I'll skip that one and just go a head and get this after all this is a prequel to the first 3 games currently out. @kingeo They did not say Europe will not get it. Isn't it a holiday in the UK? They can't be expected to announce it while on holiday. All we've been told is that this is in some way "exclusive" to North America. Japan already has it though, so either NOA is incorrect or your interpretation is incorrect. They likely mean that it's available from the start only in North America. So Europe is sure to get it too, but as in Japan you may not be able to play it until beating the main game. 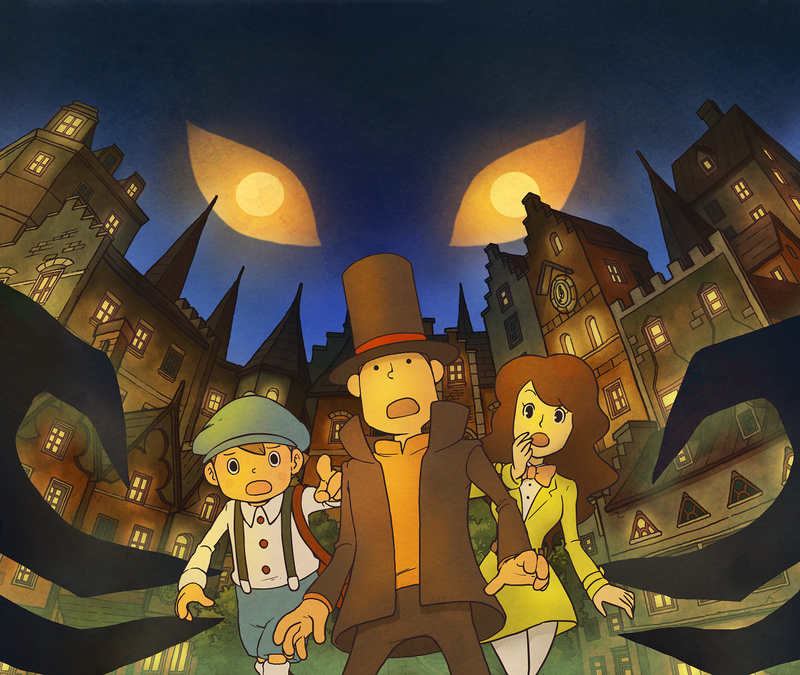 I may make this my first Layton game just for the RPG. @LordAndrew They just confirm that it won't be available as I told before so the same money for 100 hours less content and 2 years after Japan!! Heck, I'm absolutely AMAZED that NOA's actually including this part of the game. Sorry to you European gamers, but hey...at least the DS is region-free, and given current financial trends it's actually CHEAPER to import the game than buy it locally! Unlike if I want to import a European game, for which I must pay through the nose...you guys don't have it so bad, really. Except for those who don't have the means to facilitate an online transaction. I didn't know that the London bonus-game was originally a mobile-phone game! Anyway, it doesn't matter anymore now that we Europeans won't get it! What a bummer! Maybe I should send Nintendo a email, and ask if they want to bring the bonus-game to DSiware. That way I can still play it someday when I have a 3DS.